The 100th edition of the Carnival of Space is now up over at The One Minute Astronomer! Enjoy the centenary edition. Ok, I was hoping for a Beer theme and didn't have time to volunteer this week. Just as well a tipsy bat would probably not be a good thing. For many people just reading about something far away isn't enough. This is no different when dealing with an exotic location on Earth or something intriguing that's been found in deep space. In both cases pictures and diagrams help tremendously. NASA's Jet Propulsion Lab has created an online orbit simulator as a resource for people interested in the various objects whizzing around in our solar system. The animation below shows a recently discovered object. So if you are interested in the latest asteroid or meteoroid near miss, potentially hazardous asteroids, newly discovered trans-Neptunian objects, and comets, then you may want to check out JPL's Solar System Dynamics web site and their small body database search with animated orbital diagrams page in particular. Below I'll walk you through it. The small body database search lets you lookup a body with the official name like "Eris" or "Apollo", the official number "136199", or the provisional designation, "2003 UB313". Official names can take years to get in the books and lots of science articles, blogs, and even Wikipedia will use the provisional designations and sometimes unofficial names like "Xena" (not kidding) in articles. So if you can't find what you want using a name, you may need to search around to get the identifier. Once you've found an object you get a very busy looking page with lots of numbers. The numbers will tell you where the object is if you feel the need to do the math. Fortunately, you can skip the math and get the computer to it for you by selecting the link "[show orbit diagram]" near the top left of the page above the first table of numbers. This starts the simulator which runs a little program known as a Java Applet that runs inside your browser. The simulator has lots of controls that you really do want to play with. The diagram below shows some of the controls and how these diagrams start off. You'll notice that the object I've chosen an object isn't in the diagram. Next you may want to add or remove the orbits (#2). Often you'll only want to see a few orbits. 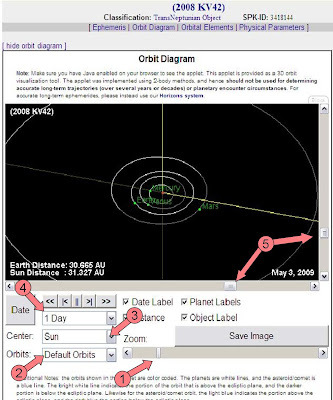 Use the drop down menu and click on the solar system object you wish to add or remove. Each line is like a switch. Your center of view (#3) will depend on what you're interested in. If you're interested in the big picture leaving it Sun centered is fine. Sometimes you'll be interested in how objects dance around each other and for that you may want to center on one of them. The player controls (#4) let you step or run the simulation backwards or forwards at different rates of speed from hours to a year. You can wind the clock back to 1600CE or forward to 2200CE. Lastly, you can change your vantage point (#5) moving around to see the solar system from below or above and rotating left or right around the plane of the ecliptic. You should notice that the shade of the orbit lines changes when an object crosses above of below the ecliptic. Zooming out brings the object into the diagram and shows its first odd characteristic. It has a very strange orbit that is almost vertical off the plane of the ecliptic and all the major planets. It's also a long way off over 30 AU (30 times the distance from the Sun to the Earth) from us. The orbits of the outer planets are missing in the diagram but they can be brought back by selecting "all orbits". To get to the animation at the start of the article I next needed to adjust the rotation controls. It's the animation that shows what still frames will not. In this case, the final odd characteristic of this object that it orbits backwards from the other planets in what is called a retrograde orbit. This tiny rock has been nicknamed "Drac" after Dracula for it's strange ability to "climb the walls". And if you want to try it yourself look up 2008 KV42 - ( orbital diagram, Wikipedia ). If you're curious about some of the smaller solar system look at the following links. Below are a number of dwarf planets, objects being considered for dwarf planet status, and asteroids (listed in order of discovery). This list may provide some insight into the current debate over the planetary status of Pluto and others. Three times have astronomers revised thieir opinion about what a planet is. Several of these objects have moons of their own but they aren't in the simulator. And if you're wondering about the first debate, it got Galileo confined to house arrest by the Church. For more see The Last Planet? Update: Pictorial representation of all known solar system objects 200 miles in diameter or larger at Kokogiak.com. For anyone interested, the Java source code for the simulator can be found at Astroarts. For astronomers that need better data, the JPL maintains a system with higher accuracy data known as ephemerides (the numbers that define orbits). The JPL Horizons system contains information on almost half a million solar system objects including 451644 asteroids, 2980 comets, 169 planetary satellites, 8 planets, the Sun, and some spacecraft. The catch is that you'll have to do the math. Each page in the simulator links to the Horizon data for the same object so you don't have to do the lookup twice. The last few years has seen an intense, sometimes emotional, and occasionally bizarre debate over what should and should not be considered a "planet". It has been one of those debates that pits the seemingly obvious against the arcane. But any way you take this, Pluto is (or was) the last planet. Somebody apparently went up to [Wittgenstein] and remarked what a bunch of morons we in Europe must have been (800 years ago before Copernicus told us how the solar system works) to have looked up there and thought that what we were seeing was the Sun going around the Earth, when as any idiot knows the Earth goes round the Sun, and you don’t have to be Einstein to understand that. To which Wittgenstein is said to have replied… “But I wonder what it would have looked like if the sun had been going around the earth.” The point being of course that it would have looked exactly the same. So how does this make Pluto the last planet? Unless you are a space or astronomy buff you can be forgiven for not knowing about the controversy over the International Astronomical Union (IAU)'s decision that Pluto isn't a planet. Pluto is far from the first object to be kicked out of the planet club. In fact, you may be surprised at some of the others that were kicked out before it. It turns out that the term planet had no formal scientific definition before 2006. Essentially, everyone was operating on a defacto understanding that had evolved and changed over thousands of years. Planet meant wanderer and included the naked eye planets Mercury, Venus, Mars, Jupiter and Saturn, as well as the Moon and the Sun! The Earth wasn't a planet because people beleived that everything revolved around it. Telescopes made it possible to find more things in the sky that we couldn't see. It also helped change our view of the Earth-centric system. Once we realised that the Earth and everything else in the Solar system orbited the Sun then the planet club changed dramatically. Both the Sun and Moon had to go and the Earth was a new member. And if our moon wasn't a planet, neither could the moons of Jupiter discovered by Galileo. As we began to see more wandering objects out there, the ranks of planets swelled. Uranus was discovered in 1781. The dwarf planet Ceres and large asteroids Pallas, Juno, and Vesta were discovered from 1801-1807 and joined the club until more asteroids were discovered begining with Astraea in 1845. A year later Neptune was discovered after a hunt based on prediction and calculation. Yet more calculations suggested another planet (that became known as Planet X) existed beyond Neptune. The hunt for the mysterious Planet X began in 1900. Pluto was photographed in 1915 but it was missed. Finally, in 1930 Pluto became the last planet. Almost half a century passed until scientists realized that the calculations that predicted Pluto were based on inaccurate data. The discovery of Pluto had been an accident. Better observations also confirmed that that Pluto was both smaller than originaly thought and not alone. The problem was that the accelerating pace of discoveries in astronomy threatened to challenge the understood definition of planet and the potential for future discoveries created further uncertainty. So the IAU, the organization responsible for coordinating all things astronomical, decided they needed some consistency and thought a definition would be helpful. After having upheld Pluto's status as a planet in 1999, they investigated and then failed to come to a consensus on a definition of planet. At the 2006 meeting the IAU was faced with confirming a tenth planet if things remained unchanged. A last minute vote on a hasty resolution of an arguably flawed definition set the seeds for this unusual debate. Pluto was out. The new definition removed Pluto from the list of planets and effectively barred entry for a number of recently discovered planet-like objects, specifically Eris (larger than Pluto), Sedna, Makemake, Orcus, Quaoar, Varuna, and Haumea. While the new definition has some merit, it is unsatisfying, poorly explained, and biased to some degree to objects located closer to the Sun. It also leaves out about 335 (at time of this writing) exoplanets that orbit other stars. Worse Pluto is now formally defined as a "dwarf planet" (but not a planet) which is linguistically confusing to say the least. The reaction to the new definition was anything but sedate. Blogs abounded with opinion, facts, emotion, and misinformation. There were even web sites set up to promote both sides of the debate. And in bizarre reaction, the sates of New Mexico and Illinois jumped in with legislation to formally recognize Pluto as a planet. I for one don't believe having planet preceded by an adjective is going to confuse the general public or force people to memorize larger lists of planet names. To me a dwarf planet is still a planet. No confusion. But a dwarf planet not also being a planet is just odd. The general public would be right to ask what planet the academics that thought that one up came from. The specialists already have a veritable zoo of names for the things they are studying. And these are not names that will resonate with the general public - nor should they. While most people can probably figure out what a Trans Neptunian Object; is their eyes will propably glaze over with terms like Plutinos, Twotinos and Cubewanos. Any specialized field has specific terminology. Beyond this there is the public or the educated public. These groups are not going to fully share the same terminology and it isn’t desirable that they do. It’s therefore a goal to have the terminology not conflict or contradict in serious ways. This allows the public to be imprecise but still generally in the same direction. It also allows the specialist to pursue high degrees of precision. In short, it allows different groups and audiences to use a degree of precision appropriate to their needs. Frankly, I believe that the IAU overreached and erred in trying to define something that they never had control of in the first place! Indeed, the IAU should generalize or formally undefine “planet”, demote the lot, and instead provide more precise terms for scientific use. The term "planet" WILL continue to be used by the general public and educators as an introduction to the subject. Far from being demoted, Pluto will be remembered for forcing this much needed rethink. Of course, Pluto would not be in this position without the (relatively) recent advances in the study of things orbiting stars including Eris, etc. and exoplanets. Orcas a dwarf planet that has been described as the anti-Pluto with an almost identical orbit but on the opposite side of the solar system like some giant cosmic balance. The yang to Pluto's ying. It's newly discovered moon S/1 90482 (2005) is looking for a name. (Personally I like Vanth as a kind of anti-Charon but there have been a lot of other good suggestions). Update: Vanth it is! See Orcus Porcus. Haumea a football shaped dwarf planet. Drac with its "climbing the walls" orbit around our Sun that is not only nearly vertical but backwards. Charon and Pluto the first known binary (dwarf) planet. Over at AstroProf there is a great series of (longish) articles exploring the history and reasoning behind the current debate over what is and what is not a planet. Defining Planets (Part IV) - Size matters, or does it? Defining Planets (Part V) - It's what is on the inside that counts? Defining Planets (Part VI) - Structure, Differentiation, and Hydrostatic Equilibrium? Defining Planets (Part VII) - How they're made? Defining Planets (Part VIII) - Wanderers, Visibility, and order of discovery: Back to the basics? Defining Planets (Part IX) - Clearing their Orbit and ideas based on some heavy math? Here's a recent post at Astroengine about a short film (and trailer) called Naming Pluto. 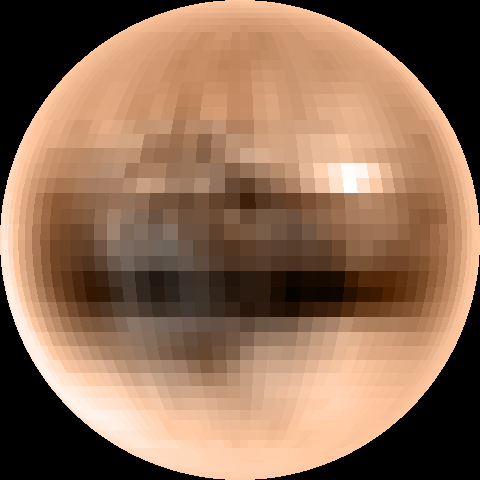 The IAU draft definition of "planet" and "plutons" | IAU News Release 2006"
Thanks to little David, one of our Beavers, who was a bit upset about Pluto's being demoted.